A visibly angry leopard rushed at a woman, tearing flesh from her arm with its teeth in a circus show. The woman, Lyubov Yakovleva, 53, struggled to protect her friend’s son Tim (Timofey), who she had taken to see the travelling circus show in Bogotol, Krasnoyarsk region, in Siberia. Moments earlier, the leopard called Loki had been taken out of the arena by its woman tamer after appearing ‘aggressive’. When it came back, it immediately rushed towards the boy and his godmother, Siberia Times reported. Lyubov said, “Suddenly he jumped in front of my nose, I only had time to cover Tim. 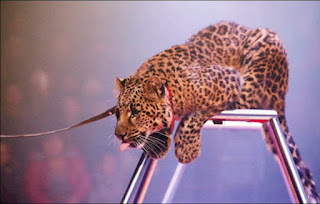 The police rushed the woman to a nearby hospital after circus staff succeeded in pulling the beast from her. They also suffering wounds too. “I felt weak and nauseous,” she said. “Doctors put in 10 stitches and her tendon was bitten all the way through, not to mention the stress and consequences in the future. “There was no safety, no fencing. We sat in the 6th row, but the animal was there in three seconds. “This fear and horror still is in my eyes,” the boy’s mother, Oksana Uskova, who was also with them said.